The architecture of the 50s and 60s has long been despised. Now, however, it is being rediscovered and appreciated by a new generation. For some though, fifties and sixties buildings are still considered ugly eyesores. Modernist principles were followed through into the design of domestic housing. However, for the most part builders watered down the ideal and compromised on a design that included some modern elements such as flat roofs and large windows, but was more conservative. 60s architecture draws strong passions in many people, whether it is an urge to pull it down or preserve it. Whilst Unit 4 sang about 'concrete and clay', much of the country was transformed in the 60s. The Tricorn Centre, Portsmouth was a daring modern shopping centre built by the Owen Luder Partnership in 1966. 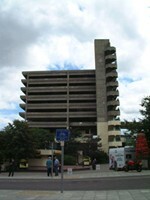 It used exposed concrete in a style known as brutalism. Unfortunately this building was demolished in 2004. Have a look at our final reflections.